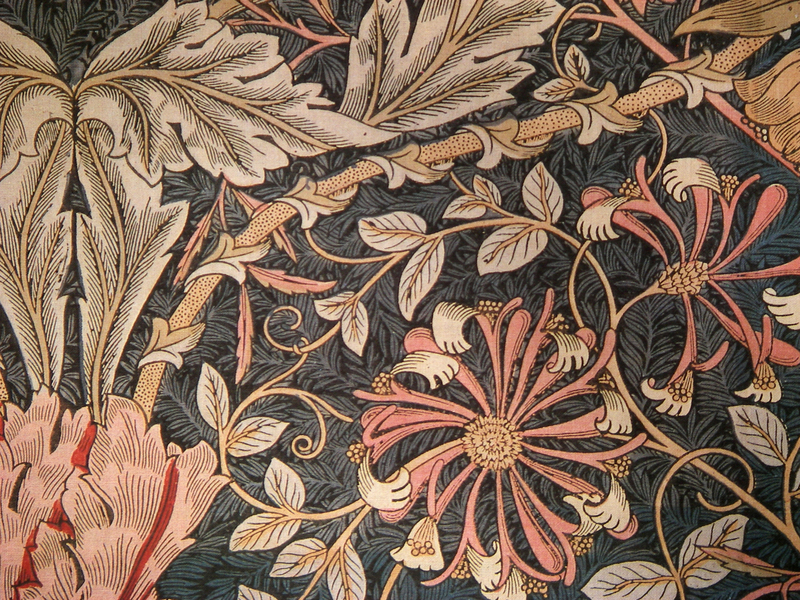 I have had a fascination with William Morris for many years, admiring his brilliant sense of design (and his business skills!). He made his art available to many through his tapestries, books, fabric and wallpapers - all with his wonderfully recognizable compositions. I had the great good fortune to visit The Victoria and Albert Museum in London, where there was an exhibit (a few rooms full) of nothing but his work! Beds and linens, upholstered chairs, so many combinations of complementary wallpapers, some even on the ceilings! 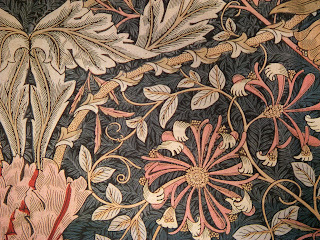 Tapestries and rugs were everywhere, books with his illuminated letters and carved furniture . 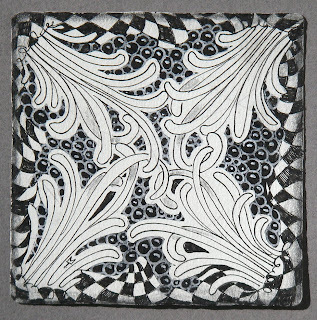 . . if I didn't like the guy so much, it would have definitely been Wm Morris overload! . . . (think MacKenzie-Childs on steroids). But I digress . . . Rick and I do happen to live in a circa 1875 Victorian, decorated in his signature color palette, (my favorite teals, salmons, greens, golds... tapestries and papers). 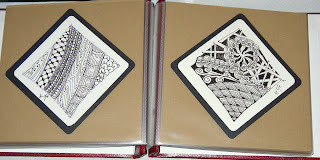 So, this blog is dedicated to my old friend "Will" who I know would have embraced Zentangle's approach. I've always been "drawn" to the very subtle images in the backgrounds of many of his designs. Behind the graceful images of flowers, fruit, animals and maidens . . . there in the darkness, hidden almost from sight were faint patterns that completely and elegantly filled the spaces. On a very dark background, he might have painted green leaves or fern-shaped tangles that softened the contrast to create a more pleasing image. You can see examples of this master's work all over the web. 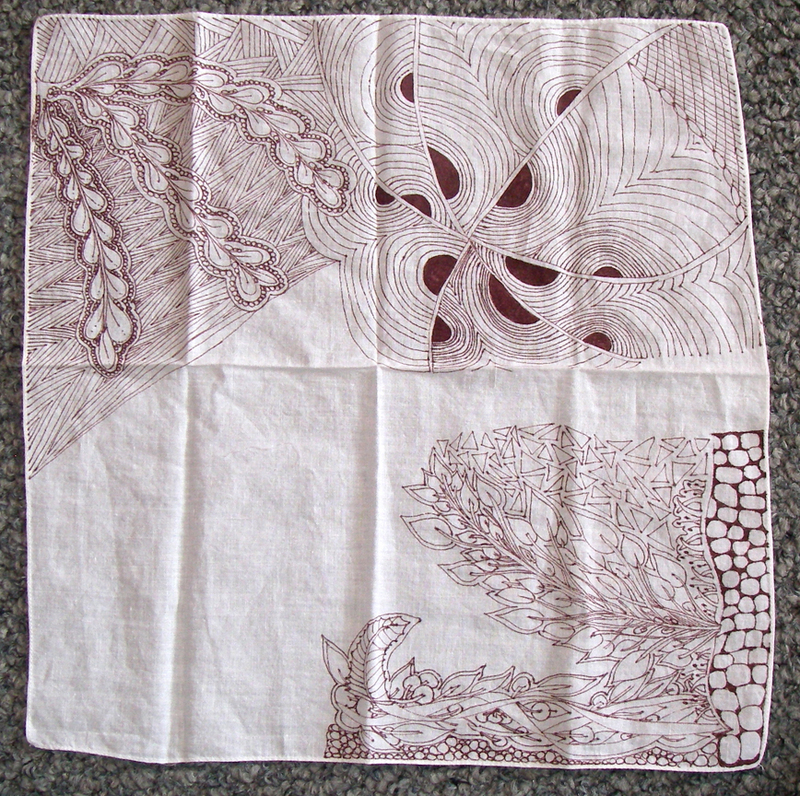 Here's an example from a placemat we have. 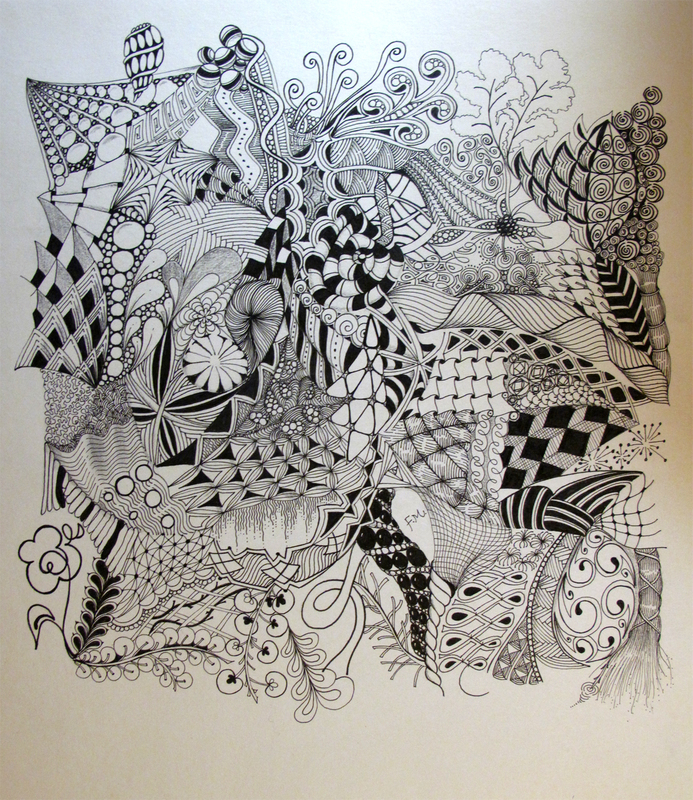 So, how did this transform itself into Zentangle.? 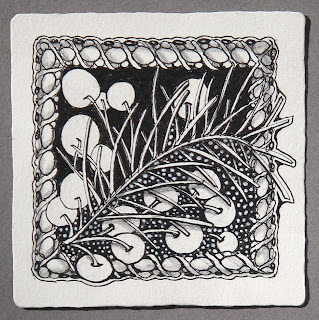 Well, I did a few of my usual Zentangles, but then I colored in the background completely in rich black. 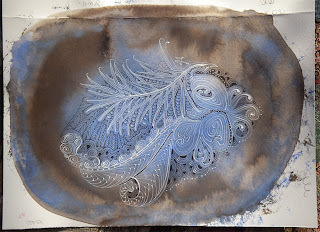 Then I went in with a Sakura Gelly Roll pen in Medium White. 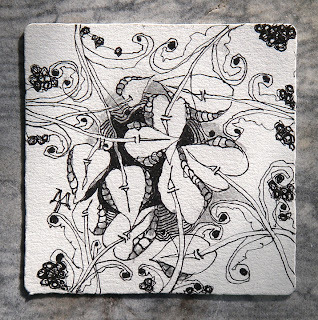 On one tile, I tangled tipple's deliberate orbs with highlights. On another tile I tangled inner auras, mimicking the negative (black) spaces. On another . 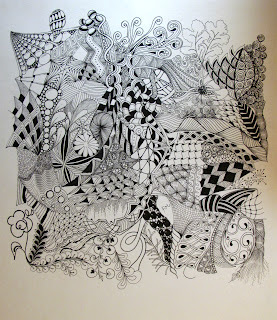 . . repeating linear tangles that I then went over with a back pen. Here's one I left unfinished to show the difference with and without the white perfs added in the background. Before posting this blog entry, I checked with the folks at Sakura to make sure their white ink was as good as their black Pigma Microns. 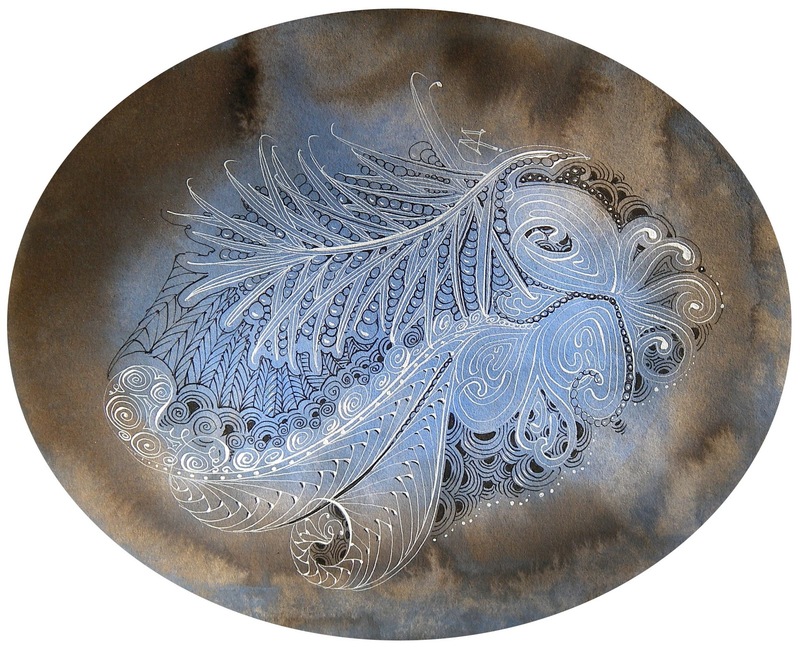 I learned that they use titanium dioxide in the ink and it is light-fast, water-proof when used on paper and has the same archival qualities as the Microns. 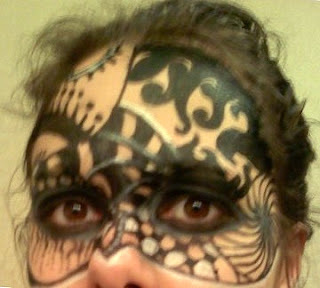 I was very glad about that because I liked the look it created. 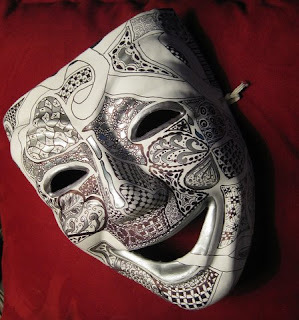 Have fun with this William Morris inspired zenhancement! So, who or what influences your tangles? Let us hear about it. 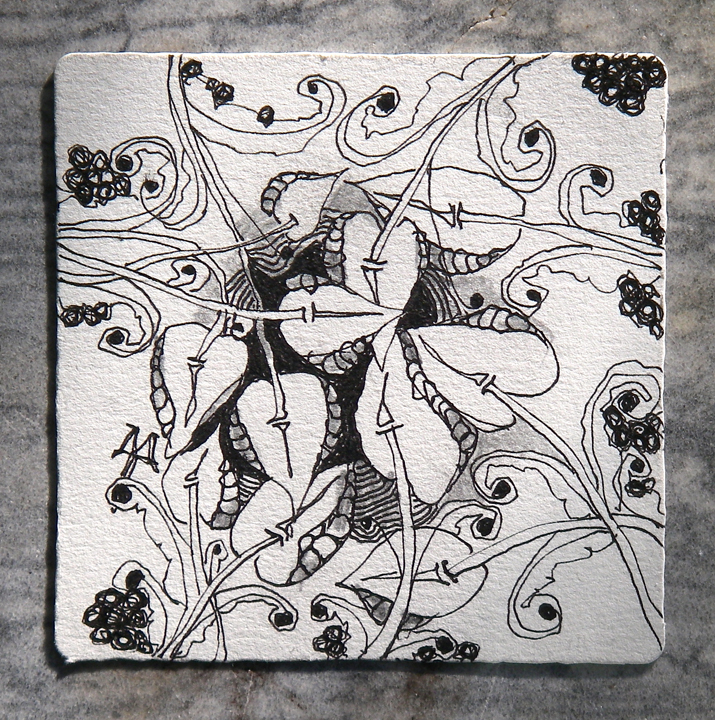 This zenhancement fits wonderfully with Zentangle's approach. When you make those interstices black, you get a wonderful contrast. Those interstices (or "space between" - I love that word!) also create a Pre-Strung Tile within a tile with their contrasting areas ready for tangling in white. We think this is a pretty significant blog "meal" so we're going to give you a couple days to digest and comment. This also works well for us as our next couple days are quite full. 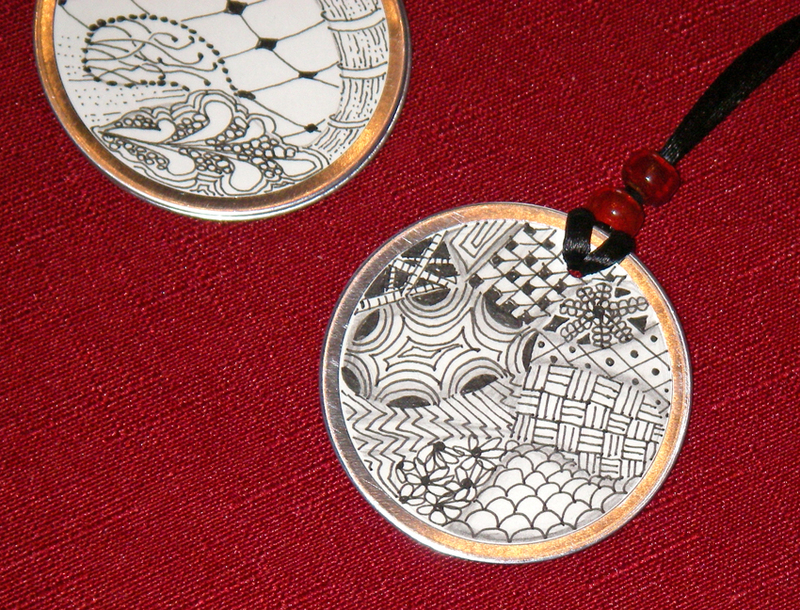 Two recent Zentangle parties to share. 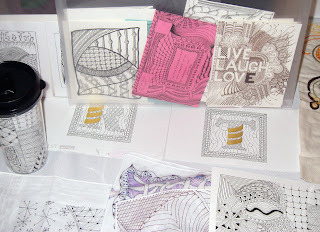 My basement space that is adjacent to my glass studio was just transformed into the perfect Zentangle space (we are calling it the ZenDen) and we had a grand opening/open house last night. 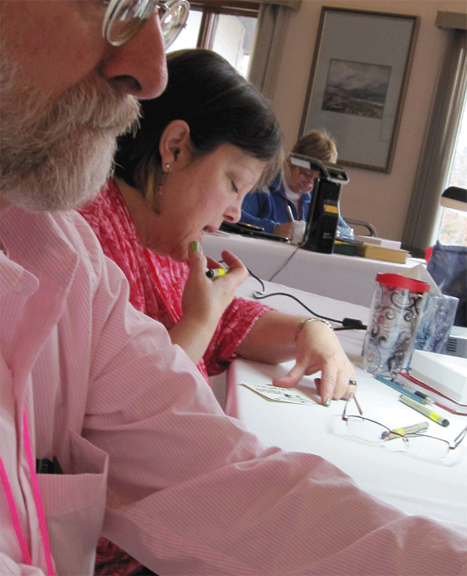 It was a huge success, and 4 CZTs attended. (Myself, LaunieMcDevitt, Deb Phelps, and Donna Penfield) About 25 people came, even though we had a freak thunderstorm/hail storm with an inch of hail accumulation, followed by freezing rain an hour before the opening. 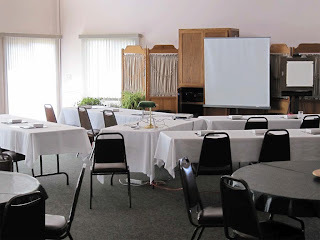 We had lots of wonderful food, and we had several different activities for everyone to enjoy. "Zetangle Pysanky" style. The eggs were brown free range organic (for the extra strength of the shells), and blown out before hand. 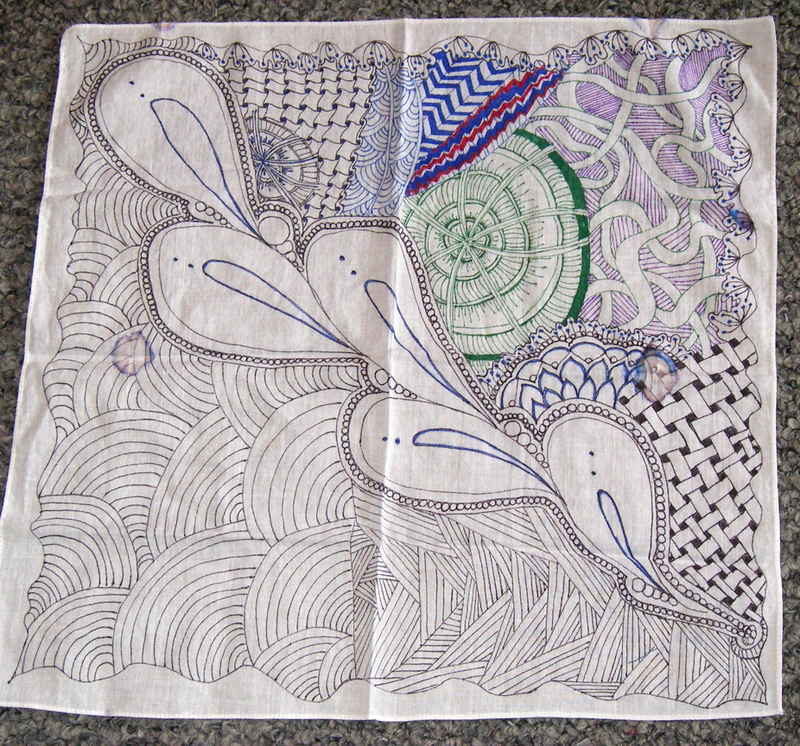 On the other side of the room was the Zen Sofa - a muslin covered Ikea sofa with fabric pens for everyone to add their favorite Zentangle patterns onto. We also had the "Golden Tangled Hare" for everyone to add their mark as well. This giant rabbit sculpture is a public art project that benefits the Cleveland Asian community (It is the Chinese Year of the Rabbit). Jodi from Now and Zen Wellness Studio was there to give hand and arm massages, to remind us to stop and breathe,and to guide us with some yoga stretches when we were getting too intense and tight. She also served her amazing living food smoothie, "The Blue Lemon". We talked her into coming back in the future for a living food cooking class! Almost every single person who attended signed up for at least one future Zentangle class, and many signed up for every class we had to offer! It was a lovely evening, and the perfect launch for the new studio space. Thank you again and again for sharing the gift of Zentangle . It continues to grow and enriches everyone it touches. 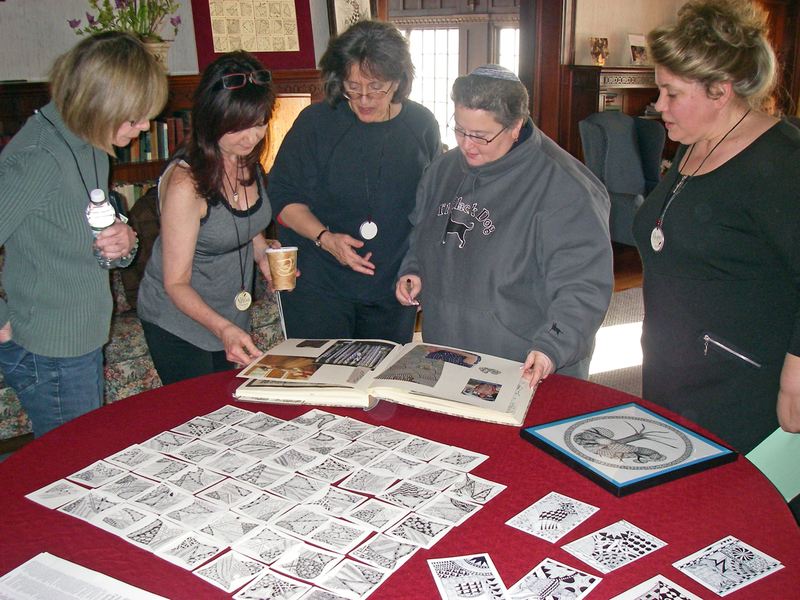 Meanwhile, over in Selma, Indiana, Carole Ohl, another CZT from Ohio organized a four-day Zentangle "FloatFest Re-Treat." 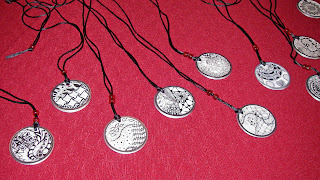 She has several blog entries on her OpenSeedArts blog about this fun event. Here are a few pictures to entice you to see more. As of this writing, Carole's FloatFest entries with more pix and great comments are here, here, here and here. How exciting to hear and see what's coming out of these wonderful events! 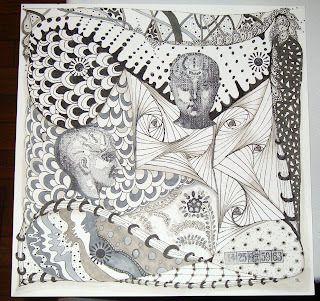 Just wanted to share a Zentangle adventure. My sister-in-law raises llamas in Colorado. After seeing some of my "tangling" during a family cruise in November she contacted me to see if I had any ideas for some special awards her farm was sponsoring for an upcoming event. 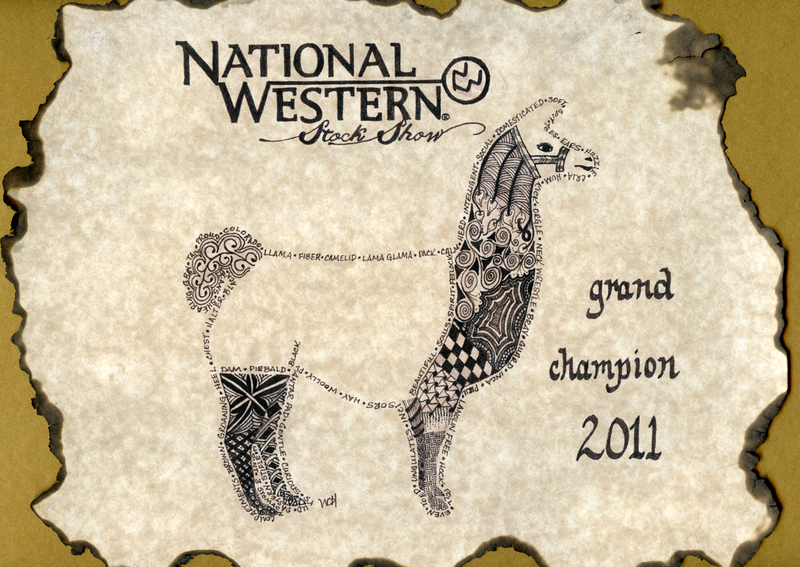 The event was the National Western Stock Show that runs for 3 weeks each January in Denver. She was looking for something she could present to the Grand Champion & Reserve Grand Champion in each of the llama classes, 22 awards in all. She wanted the awards to somehow relate to the theme of this year's show, the Wild, Wild West. 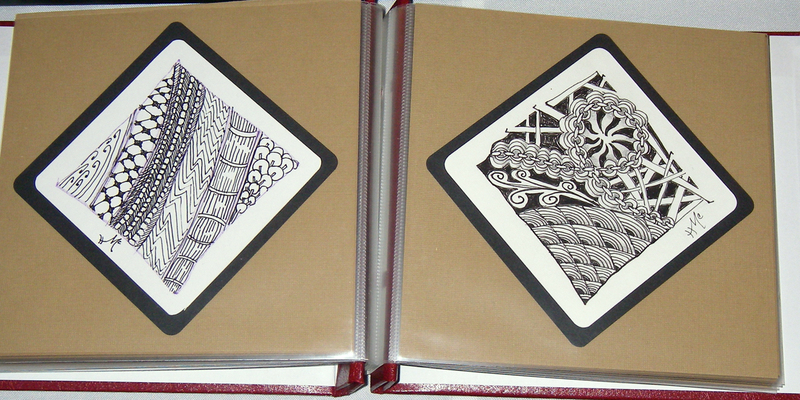 I decided to try something I would never have done prior to learning to Zentangle & becoming a CZT. 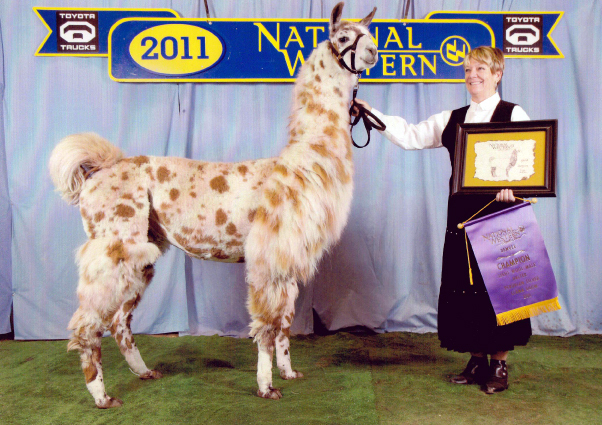 On gold parchment paper I used words that describe or relate to llamas to outline the shape of a llama and then filled in the areas of the body that are typically not shaved short, but left with fiber, with tangles. Above that I traced in the official NWSS logo and brand and added the Grand Champion or Reserve Grand Champion titles in front of the llama. After they were complete I burned the edges of the parchment paper, making them resemble old western posters. My husband, Jeff, then matted and framed them, with the Grand Champions floated on gold mat board & the Reserves floated on silver mat board. We boxed them all up and shipped them to his sister at the show headquarters. The day she picked them up she called us on her cell and was ecstatic about them. She also said that other "llama people" at the show were talking about how unique and nice they were and how badly they wanted to win one. Afterwards she said they were a huge hit and that a member of the Alpaca association had asked for my contact info because they were interested in getting something done. We've also had a couple of llama ranchers request ones made specifically for their farms/ranches. 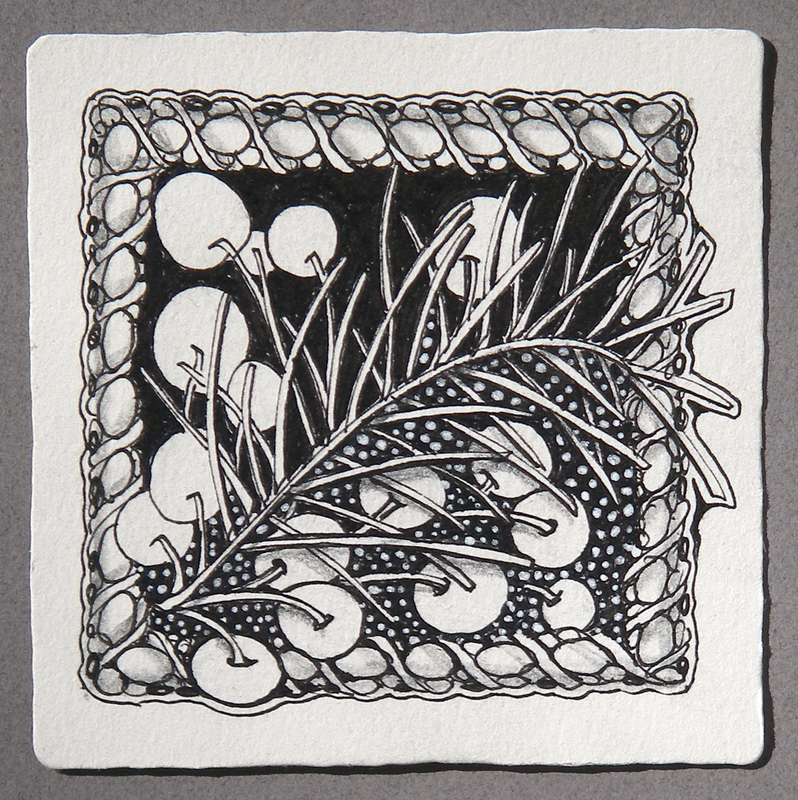 I've attached a picture of one of the award winners in the show, as well a picture of one of the finished awards. I just wanted you to know how Zentangles and llamas had ended up together and how much everyone at the show enjoyed them. Thanks so much for giving all of us that are "drawing challenged" the opportunity to create something that others appreciate and enjoy. Congratulations, Wendy! And thank you for sharing your story and pictures. That award is beautiful. 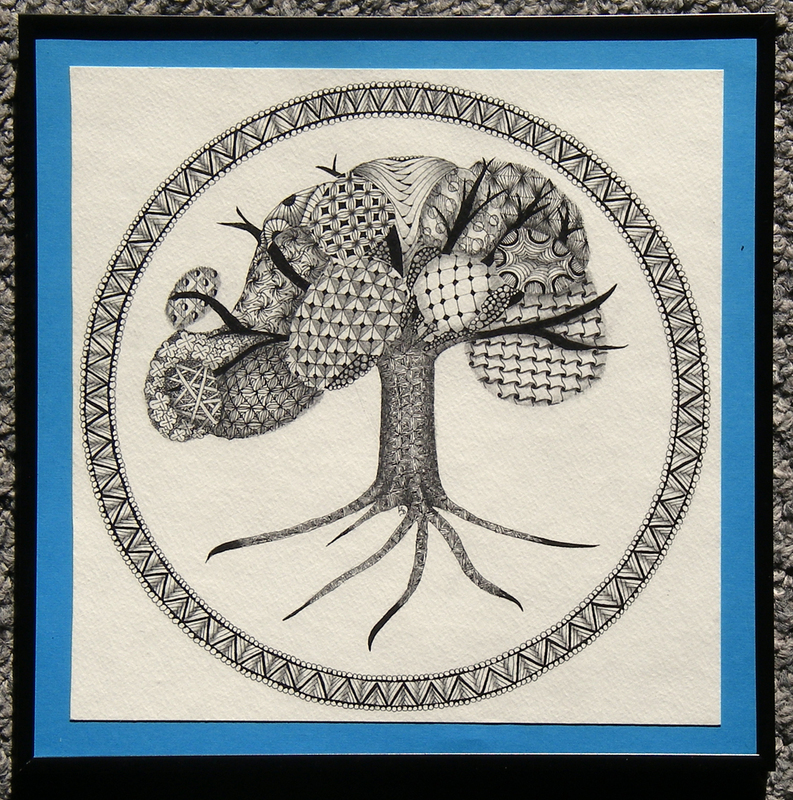 Your story is a great reminder of how empowering Zentangle can be. 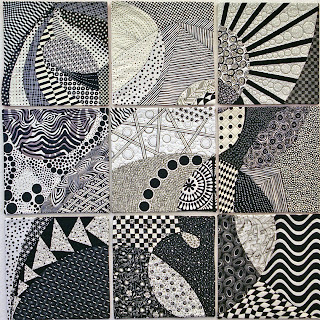 We, Sandra Harrington, Pat Dicker and myself, Loretta Armstrong, would like to share with you our quilt inspired by your Zentangles. We had a wonderful time creating it. 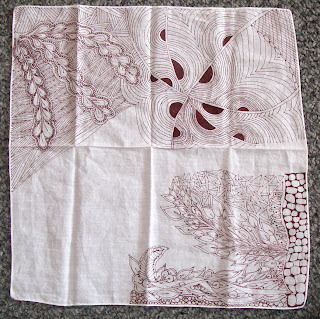 We made a sketch of one of your Ensembles and enlarged it to 3 by 3 feet [91 by 91 cm] then divided it into nine 12 by 12 inch [30.5 by 30.5 cm] squares, cut them apart, and each of us chose 3 of the squares. 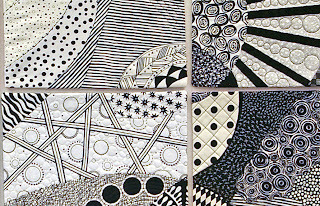 The only rule: we could use only black and white fabrics and embellishments. We decided on a date to get back together. We brought along our squares and placed them on the design wall. The result was/is WONDERFUL!!! 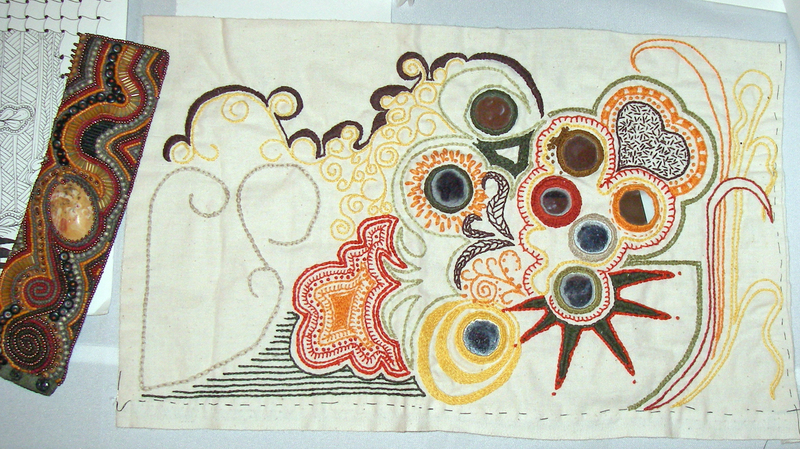 The movement of the fabrics chosen, when assembled, was a fantastic surprise, don't you think? 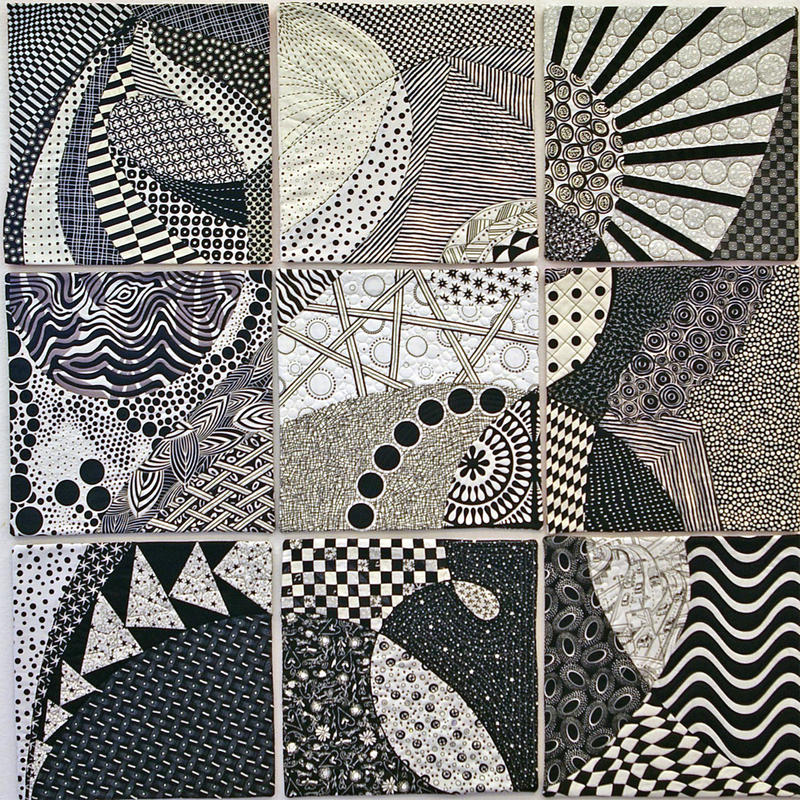 We exhibited our art quilt at the 142 Throckmorton Theatre in Mill Valley, California, and received tremendous raves from the visitors. 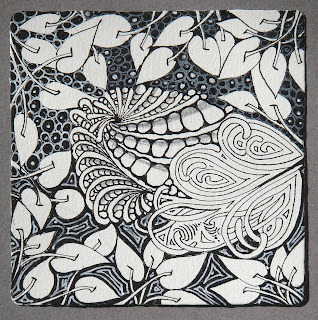 We thank you so much for your inspirational Zentangles. Here's a more detailed view showing their tangle embellishments. This Ensemble String inspired their creation. It's one of two Ensembles in our Ensemble Set. We invite you to explore these which are available on our website or, create your own. 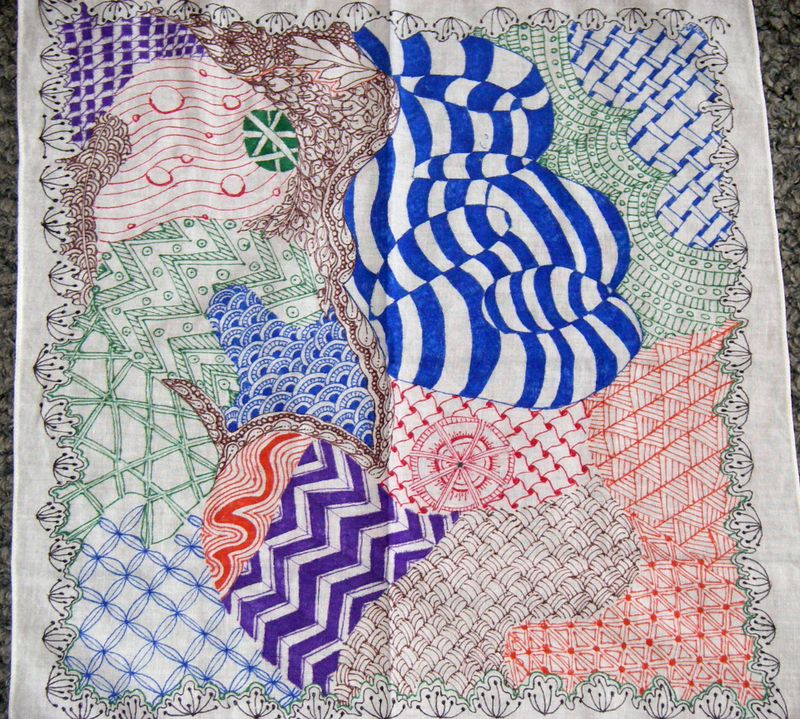 Tangling an Ensemble is a wonderful way to explore the possibilities of Zentangle with a group or, by yourself over time. If you missed it, check out this Ensemble (the same one actually!) which our daughter Molly created in Nine Days of Naptime. 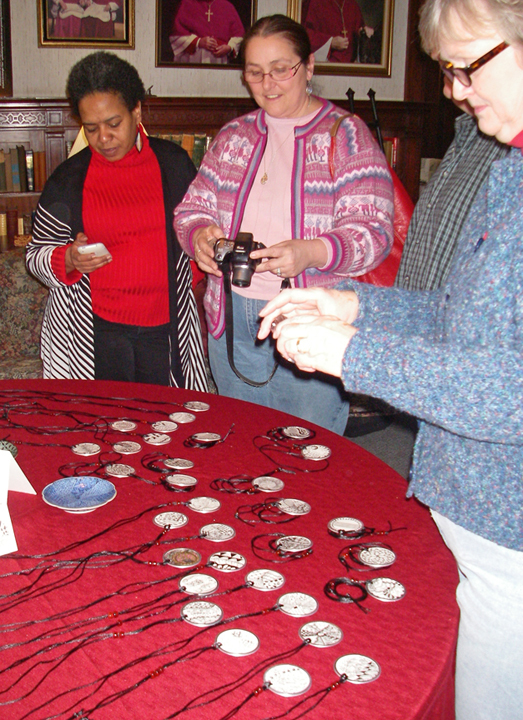 Thank you, Loretta, Sandra and Pat, for sharing your beautiful creating with us all. I hope you don't mind me sending [. . .] my first "tile" and a painting I finished yesterday. 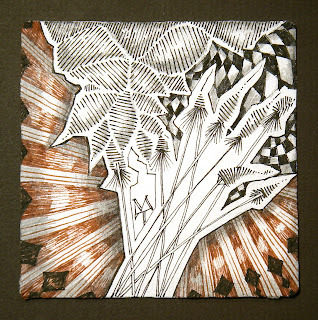 I make watercolour, graphite and ink paintings that normally include abstract images that I find in the initial watercolour work, and then I add realistic drawings of leaves, plants, etc... so I tried one with Zentangle instead. I love it. It was so relaxing and always a discovery. Thank you for your creation of Zentangle. 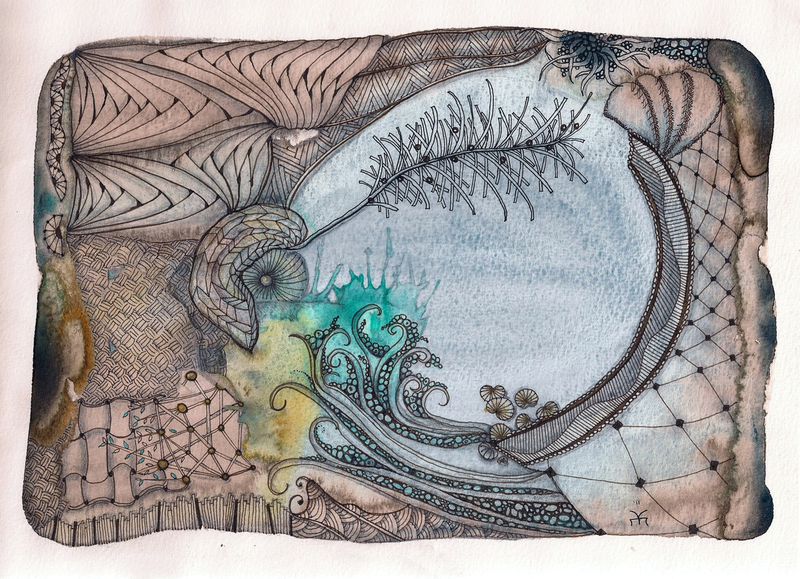 Thank you for sharing that, K. We love how you worked with your watercolor's self-created border and string. Click imager for larger view. 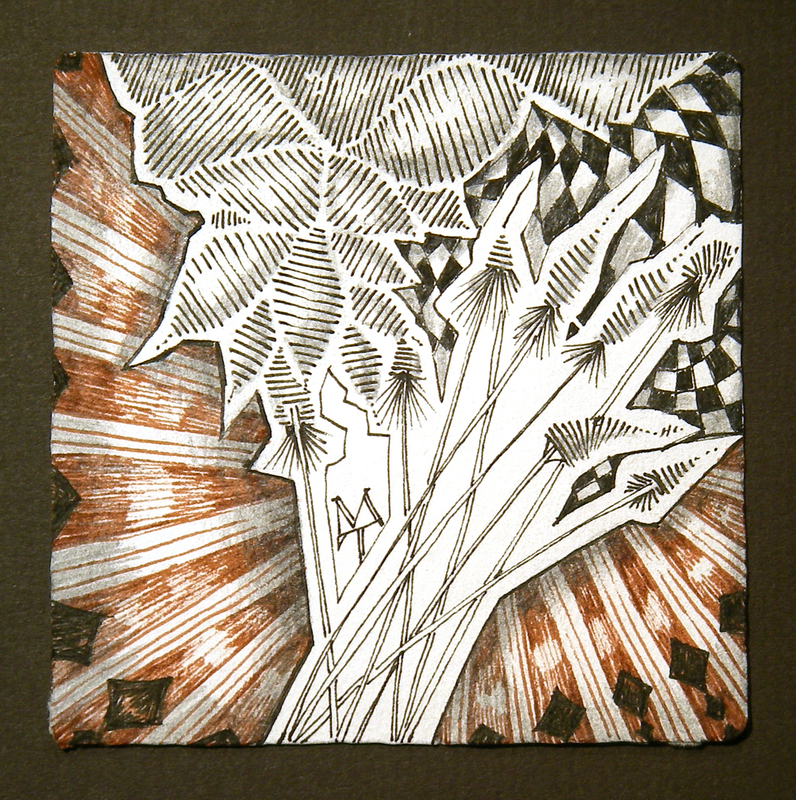 Laura Harms' Challenge series continues with #14, I Walk the Line - create a Zentangle with only straight lines. I blame it all on Rick . . . if he hadn't taught me to dance . . . I might have been really good at straight lines. Now I feel all I want to do is dance. But dancing in straight lines is so, well, "Frankensteinish" . 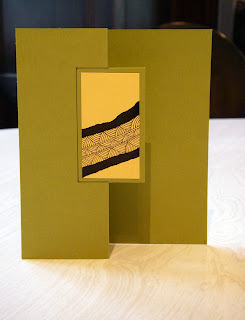 . . so of course, all I was looking for was creating curves out of straight lines . . . (line dance?). 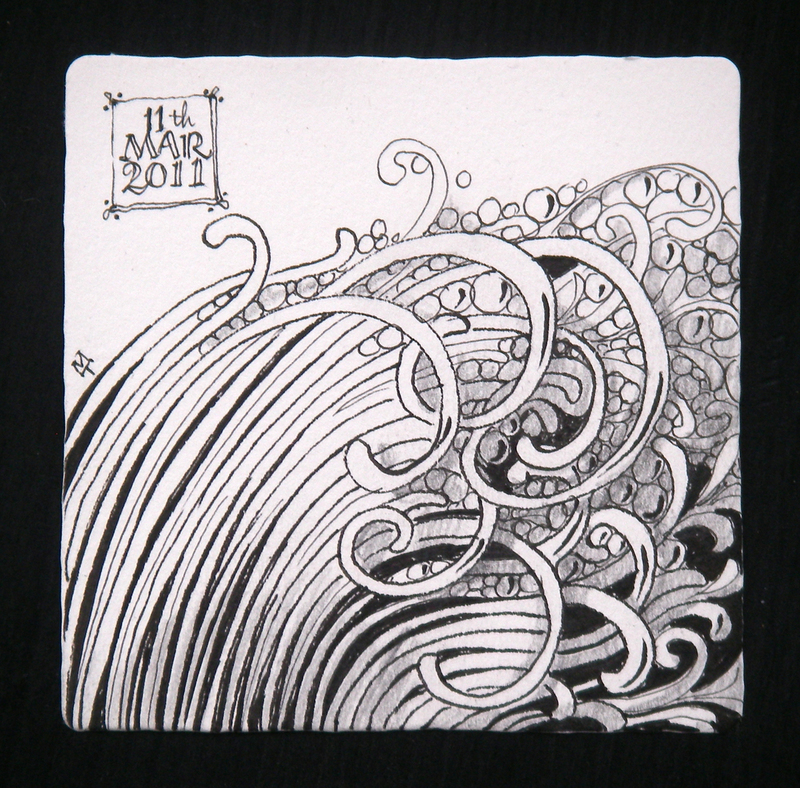 All of the lines in this Zentangle Inspired Art (ZIA) piece are straight (at least as straight as I can make them) - even the swirly knightsbridge is created from short straight lines. This ZIA* was done on a Zentangle tile with Pigma Micron 01s in black and brown with pencil shading. 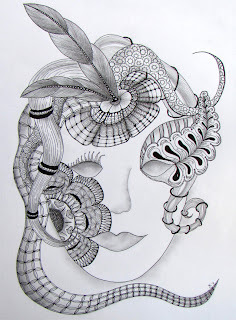 * You'll occasionally notice the term Zentangle Inspired Art or ZIA for short. This is part of an exploration towards a coherent vocabulary. 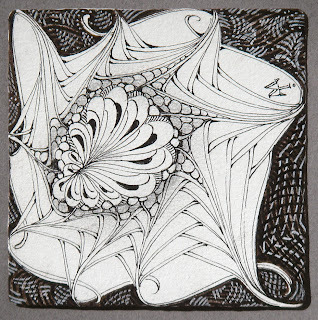 We're "trying on" different ways of referring to creations done according to Zentangle's teaching method, but which differ from a classic "Zentangle" which is black ink with pencil shading on a 3.5 inch square Zentangle tile. Thanks again to Laura Harms, CZT, for an amazing series that's taken us through winter and into spring . . . Ah, Spring! . . . (or for our friends in southern latitudes, summer into fall). 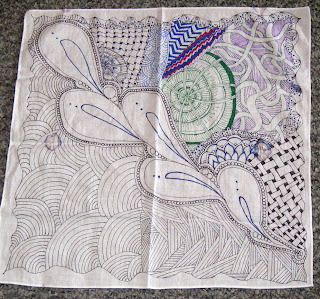 Fina Man, CZT in Hong Kong, sent us this beautiful large Zentangle with 87 tangles. We left the file size pretty large so you could appreciate it more. After you click on this image, click it again to see fine detail. One paper . . . 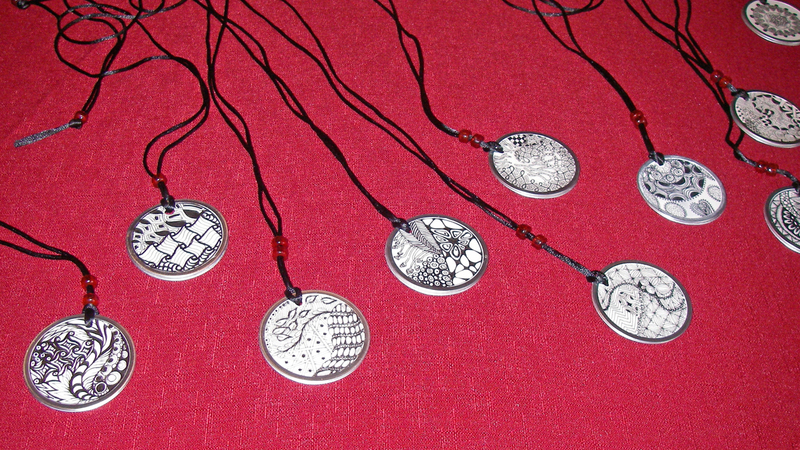 I really love your zentangles. It inspired me to make one of my own. 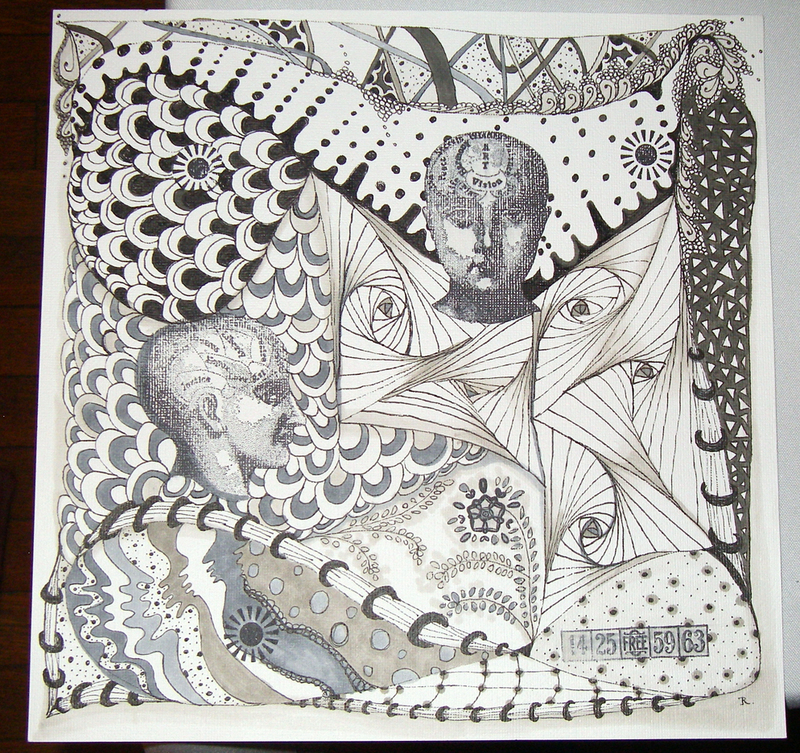 The pictures showes my first zentangle on A3 size. Before I made a few small zentangles. My English is not that good, so I am not using as many tekst as I wish that I could use to tell you my story. One plastic . . .
One skin . 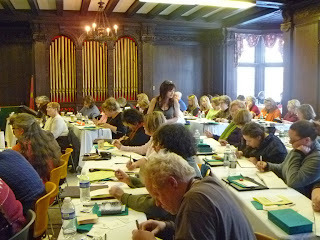 . .
Back in November, I taught my first demo/practice class to my children and their friends. It was great, if a little rowdy! Yesterday I received the attached via phone, with the message "Look what my beautiful fiancee did with the new skills you taught her :- )"
I've cropped her some, and I DO have her permission to share/post this! Thanks to all for sharing these. We couldn't wait for Halloween to post them. Laura Harms, CZT, has posted her Challenge #13. 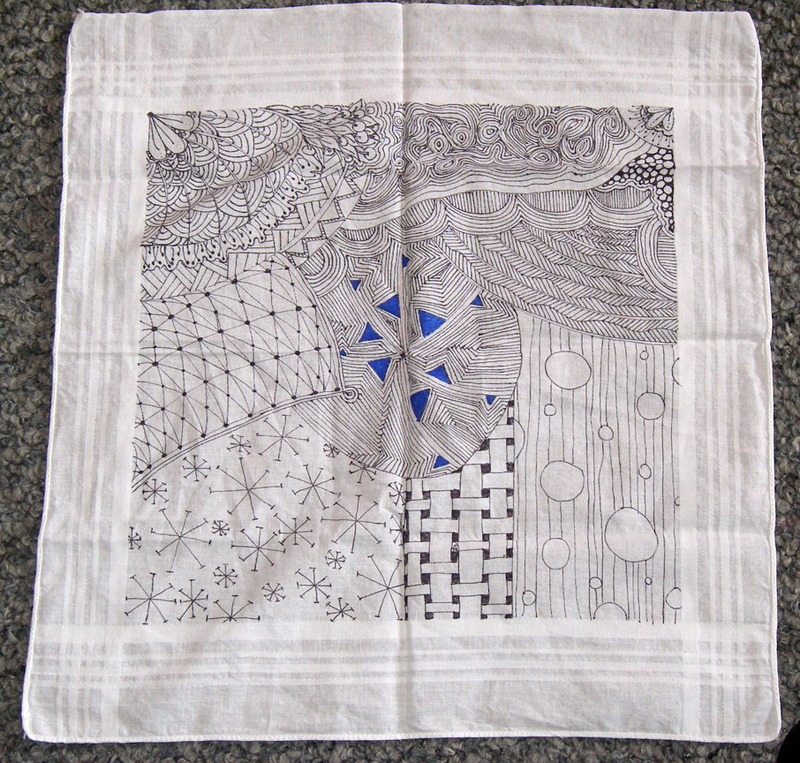 Create a Zentangle with your non-dominant hand. This is something we always recommend people try. Working with your non-dominant hand is a fascinating world to explore. Before our laptops insinuated themselves onto our kitchen table, Maria and I (both righties) would have Sudoku races at breakfast. We'd print two large copies of the same puzzle and then do it up-side-down and left-handed! Using a pen, pencil, markers, whatever, and, using your non-dominant hand, scribble, draw, doodle or make marks on a piece of paper. This reminded me of a letter we received from a math teacher in Australia. "One of my classes had a 2 hour exam today. Two hours for 13 year-olds is a big ask and as expected, they were getting very restless towards the end. One student is notorious for being disruptive and he finished 20 minutes before the end. He started by initially making as many different popping sounds as he could. I gave him a bit of paper and told him to draw. So then he made as much noise as he could by scribbling! 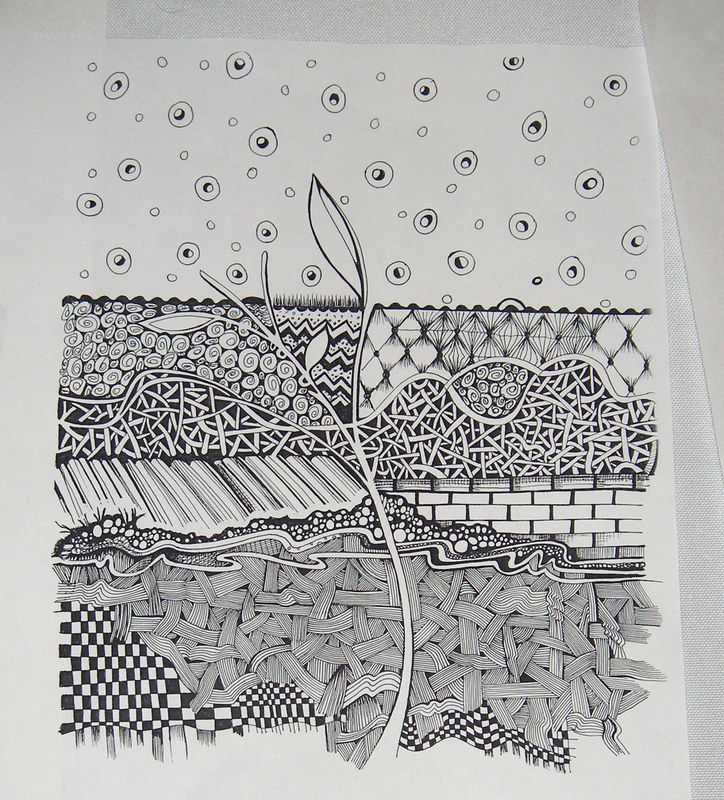 So I showed him how to do a Paradox Zentangle. What a transformation! He really went into a zone - and was quiet for the last 20 minutes. "The Zen stuff really works. Thank you, Rick & Maria!" 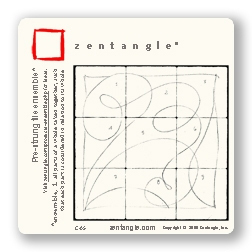 Our point is that Zentangle's process of string and predetermined tangles from which to select can contribute significant value to your exploration of non-dominant handed creativity. It's a fascinating field that's worth exploring. 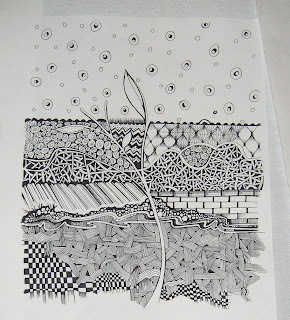 Here's Maria's non-dominant handed Zentangle challenge contribution. In our morning's email was this message from Amy. I recently discovered the art of Zentangle and decided to enter a contest which allows me to design my very own racecar for NASCAR racing. 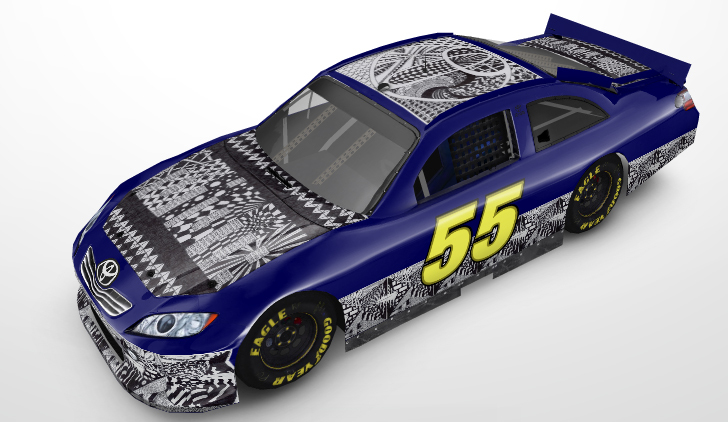 I spent the better part of 2 weeks drawing the design for this car which bears the TOYOTA emblem as well as the TOYOTA wording. 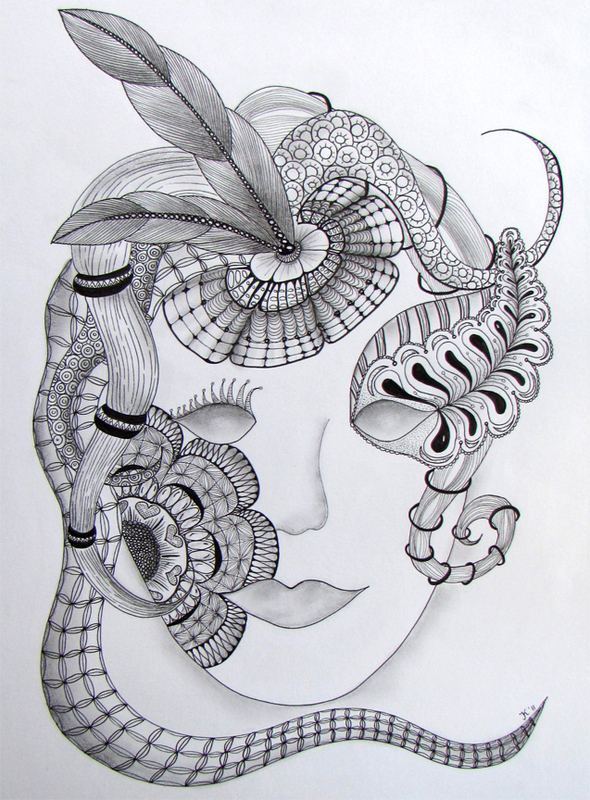 I would LOVE your support, would you be interested in helping me obtain votes to help get the art of Zentangle a public eye? My family and I are hoping to get as many votes as possible to win an experience of a lifetime. You can spin her car around to see more of her tangles. Thanks for sending this to us. We hope you get lots of votes! 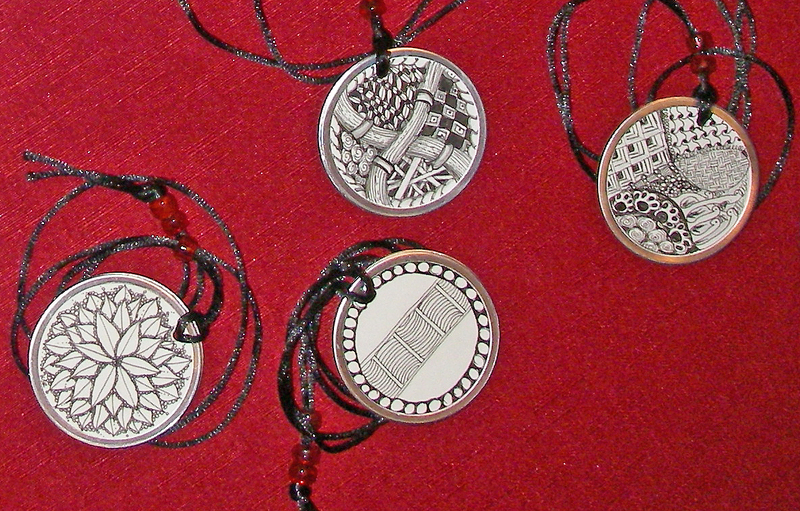 In recent weeks we've added substantially to our list of blogs that focus on Zentangle. Once upon a time, we would announce new additions as we added them. But now we've added so many that if we try to list additions, we're sure to leave someone out. 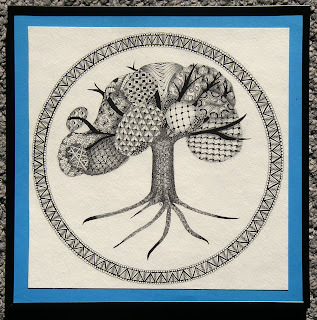 Please take a moment to enjoy some beautiful Zentangle inspired creativity and passion that is on display in these blogs that you might have missed. They are listed to your right under links. 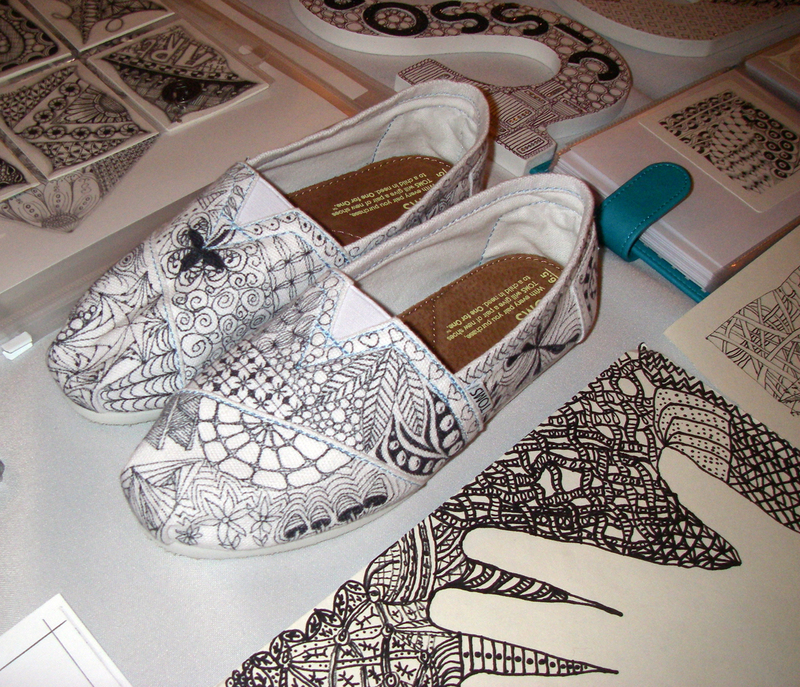 To everyone posting your Zentangles and telling your stories, thank you so much for sharing your creativity and passion. Name tags can be so predictable. We encouraged everyone at our CZT training to tangle their name tag on its blank side. After they were varnished, we laid them out to be retrieved. It made for some nice pictures. Each one so unique and wonderful - just like everyone who attended. We found these folded and stacked on one of our display tables. They really wanted to be opened and appreciated. 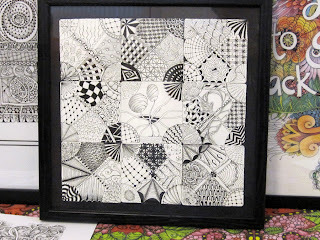 For your continued enjoyment, here are more images of Zentangle inspired artwork that found its way onto our recent seminar's buffet of creativity. Maria points out images from our scrapbook of tangle inspirations that we've collected over the years. Blue off . . .
. . . the beaten path. One benefit of a 40 year-old studio is instant access to all sorts of artist "toys" I've collected over decades - beautiful papers, wild & crazy pens, hand-made inks, but most important of all, heart. This last one, "heart," is my true reward for having done something consistently for so many years, a confidence to try new things and a passion that doesn't worry about mistakes. 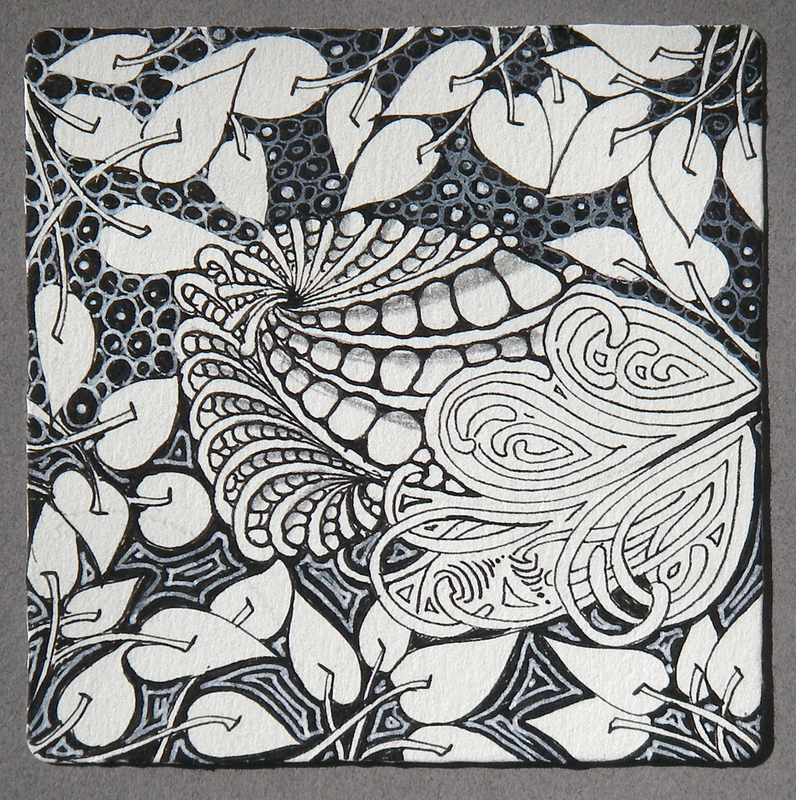 This confidence and passion of heart is what we strive to make available to others through Zentangle . . . without the 40 year wait! 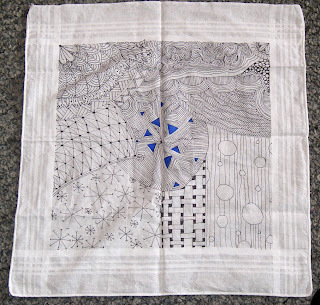 Maria created this piece as her contribution to Challenge #12 from Laura Harms, CZT - "Something Blue." She describes her process . . . 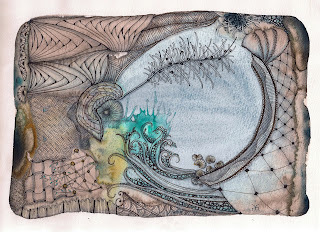 This ZIA (Zentangle Inspired Art) started off with Arches hot press water colour paper with a heavy wash of blue gouache (an opaque water colour). When the paint was still wet (very wet) I added some drops of walnut ink around the edges. After it was completely dry, I used an oblique pointed pen with Dr. Martens Bleed-Proof white and a Sakura Pigma Micron 01 for the black lines. 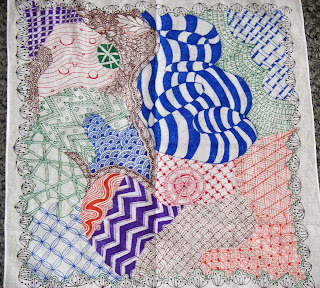 I started with verdigogh because it is easier to place tangles around it than it around tangles . . . or maybe not . . who knows! Here's her original before cropping. 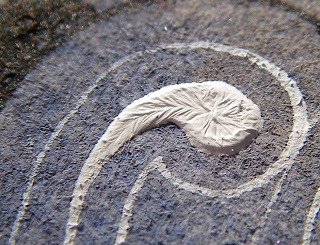 When I was photographing this, I noticed the white ink joined in our fun and tangled itself within its own string. Thanks once again to Laura Harms for creating this series. We encourage you to visit her blog and enjoy slide shows of previous challenges. When we were out at the Craft & Hobby Association show in Los Angeles, some folks from Scrapbook Dimensions Magazine and Stamp Addict dropped by and asked to do an interview. 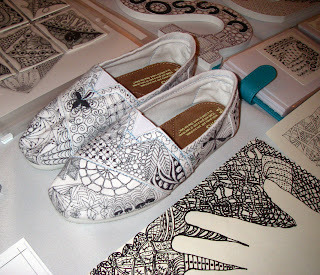 There's some talking, a bit of tangle instruction (purk) and a shot of some really cool shoes. We are working on some new videos and we look forward to sharing them with you soon. As we continue our virtual walk along tables full of Zentangle inspired art from our February, 2011, CZT training . . . another veritable feast of visual treats! 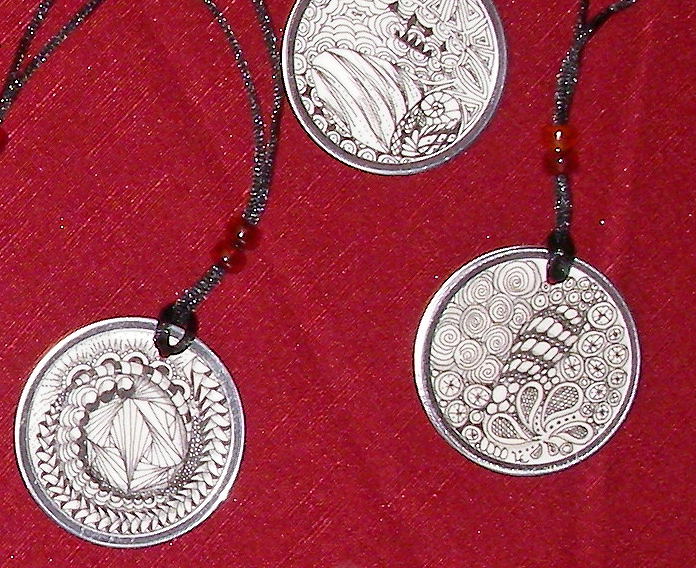 These next two images are of pieces created by Christina Vandervlist, CZT, from Burlington, Ontario [email]. Christina happened by as I was taking these pictures. 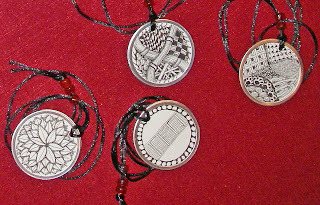 She explained that both were done in a "Zentangle way" of "one stroke at a time" without knowing in advance what it would look like. 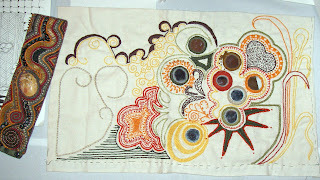 The top image is free-hand crewel embroidery with no hoop, done "one stitch at a time." 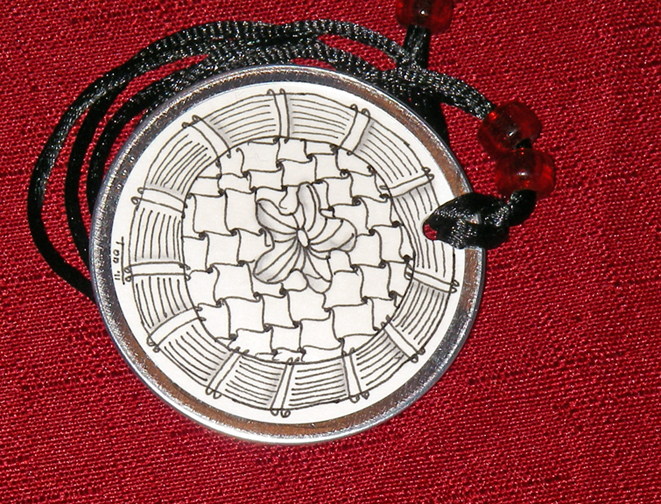 Below that is a freehand beaded bracelet using Zentangle's aura approach, done "one bead at a time." One more bit . . . Here's a view of our classroom in the retreat center's grand ballroom. Maria's walking around appreciating what everyone's creating.